This walk: 2010-12-15. Sheep, Lydford/Bridestowe-Sourton parishes boundary stone, Widgery Cross, Bray Tor, Arms Tor, Great Links Tor, Little Links Tor, King Way, Rattlebrook railway, Great Nodden, newly-found cross, King Wall, corn ditch, Lake viaduct, cross base, Strollers Christmas lunch. Sheep in a field near the Fox & Hounds Hotel, Lydford, aligned to the local ley lines, presumably subsidiary to the main Michael Line that runs through this part of Dartmoor (through Great Links Tor), from Land's End to Bury St Edmunds. 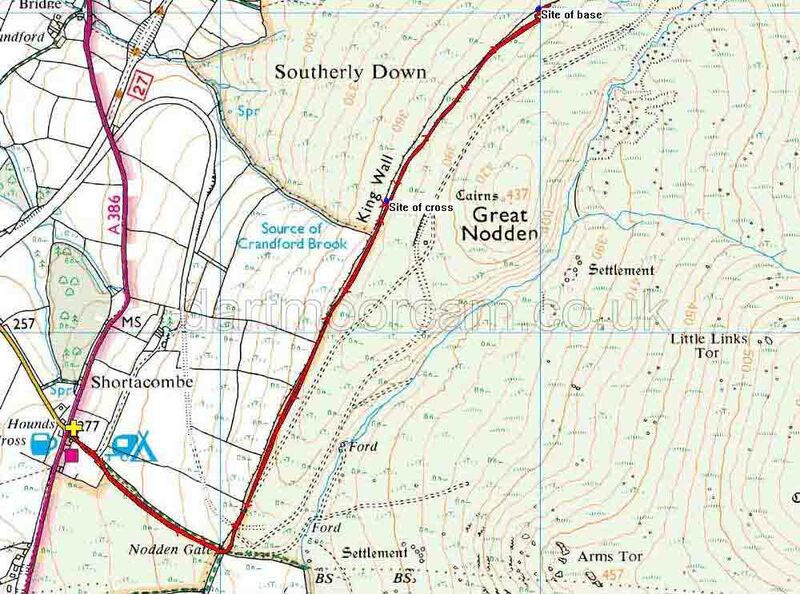 B S - this signifies Bridestowe and Sourton Common, the unusual situation of lands held jointly between the two parishes of Bridestowe and Sourton (source: Dave Brewer, Dartmoor Boundary Markers, 2002, Halsgrove, page 174-175). This stone was fallen for many years and re-erected in 1988. The book has a photo on page 174 that shows it fallen with B S uppermost. The cross is on the right-hand tor, Brat or Bray Tor. The left-hand tor is Arms Tor. Distant view to Great Links Tor (right) and Little Links Tor. Looking along the King Way track - part of the Tavistock-Okehampton section of the Plymouth-London coaching road that took the King's mail, the king in question believed to be Charles I. The railway, on an embankment here, leading down to Bridestowe station. Great Nodden, also known locally as Plum Pudding Hill, the embankment of the peat railway can be seen skirting its base. A copy of one of Tom's photographs of the cross before it was removed. It was found that the bottom section of the cross was missing, although it was later found about 800 metres to the north-east (see below). There is currently a question as to where the cross should be re-erected, with many favouring the site of the base, as this lies on what some believe is an old monks' track. Looking along King Wall, showing it to be a corn-ditch with a steep wall and ditch on the outside (Royal Forest side) to prevent the king's deer from entering the enclosed farm land with its crops and with a built-up inner side to help the deer escape back onto the open moor. Zoomed view along the wall. 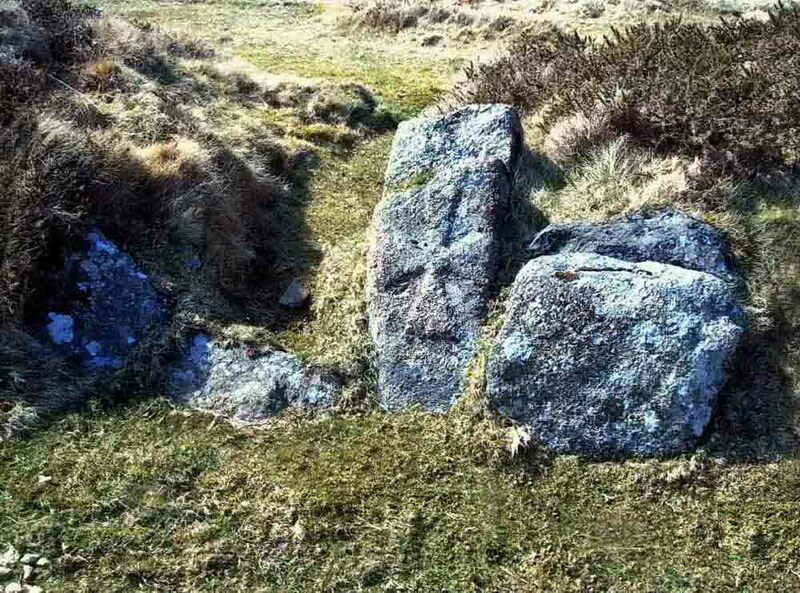 What is believed to be the base of the newly found cross, at SX 53995 88015, this being a stepped structure. Strollers being told more about the cross and its probably being sited here beside an ancient track that is now more of a drainage channel. "And there is one over there ....."
"And another one over there ...."
Keith, not usually in the photographs! This walk was accessed by parking at the Fox & Hounds car park on the A386 between Mary Tavy and Sourton, marked by the yellow cross and public house symbol on the map.